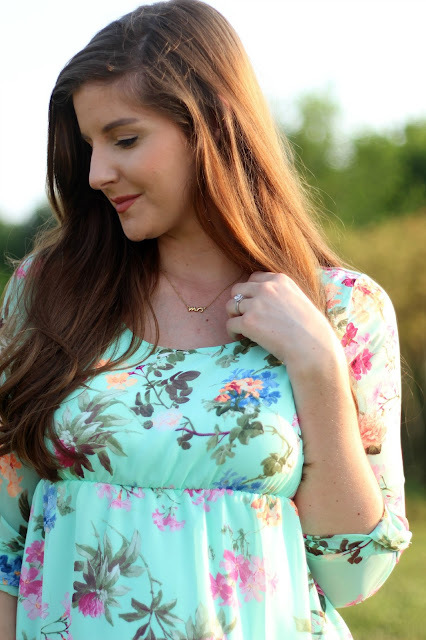 I am OBSESSED with this Pinkblush dress! I keep singing over and over again, "I just can't get enough...I just can't get enough"...#80spopforthewin. PinkBlush Maternity makes such cute maternity clothes, and I literally want everything on their site! I wore this maternity dress to work and I have literally never received so many compliments in a single day! When you feel good about what you're wearing, the day can't be bad. Okay, onto the 21/22 week update! I can't believe how fast this is all flying by. Now that we're in July, this officially marks the last month in the 2nd trimester. I'm totally doing a little happy dance. Total weight gain: SEVEN pounds! I couldn't believe it when I went to my last appointment. Safe to say, baby is officially growing :) They moved my due date back to the end of October because he is measuring big, (1.08 pounds!) but i'm not getting my hopes up for an early arrival. I want him to cook as long as possible! Stretch marks? none on my belly, but I was noticing a few on my hips, they're barely noticeable but definitely there! Sleep: Last week I finally caved and bought a snoogle, and sleep has been heavenly. I couldn't decide between the snoogle and the bumpnest, but they are made of the same materials and the snoogle is half the price, so I was sold! Best moment this week: Seeing our little man healthy as can be. There is footage in the video below of him shaking his little baby booty for us and I just died! It was so relieving to know he is right on target and healthy as can be. This pregnancy business really wears on my nerves! Movement: This week I think i've felt him move less, but definietly stronger each time I do feel him. I talk about it a little in my Vlog, but we still have a long way to go and I already feel like he is running out of room in there. Or maybe he is growing up instead of out, because the smallest meal makes me feel like i'm going to EXPLODE! I would love if my organs can make a little room for him! However, last weekend hiccups started and those feel pretty silly. Anything making you queasy or sick: Still really grossed out by garlic and melted cheese. I did eat a slice of pizza last weekend but it was only because it was my only option for dinner at a friends house, and it was gross. Labor Signs: Braxton Hicks have been really infrequent the last 2 weeks. I've been drinking about a gallon of water a day, and I think that is really helping. No labor signs, thankfully! This guy has a while longer to cook! Symptoms: Feeling really full and uncomfortable all of the time. Super short of breath also. I'm pretty certain he is putting pressure on my stomach/lungs which is why it's been so uncomfortable lately. But other than that, nothing, and i'm so grateful to feel so good! Belly Button in or out? Hanging on to her last days as an innie. Almost popped all the way out! Happy or Moody most of the time: So happy I could cry. I do sometimes just because I can't believe this is real life. also, #hormones. I always start the day with my devotions and every morning it feels like the same exact prayer. I'm just so thankful for this healthy pregnancy. It's not lost on me how many women struggle so long to conceive, or are unable to carry a healthy pregnancy to term, and I just feel overwhelmed sometimes that we've been able to. I feel really thankful for that every single day, and it makes any kind of moody feeling disappear! I was going through my phone looking for some bump selfies i've taken this week and there weren't many. So I had to share this cute little one of my favorite not-so-little guy napping on the little guy in my belly. And the bump is looking LARGE AND IN CHARGE in my favorite PinkBlush denim! I'm wearing these jeans today and my legs have never been so happy! I love sharing this journey with you, and i'm so happy to have the support of such an awesome blogging community. :) I ramble for way too long in the Vlog below, but you get a little peak and some baby finds we picked up this week, and you can come into the ultrasound room with us to watch our Sawyer wiggling around! If you've missed any of my pregnancy updates, you can find them all HERE! 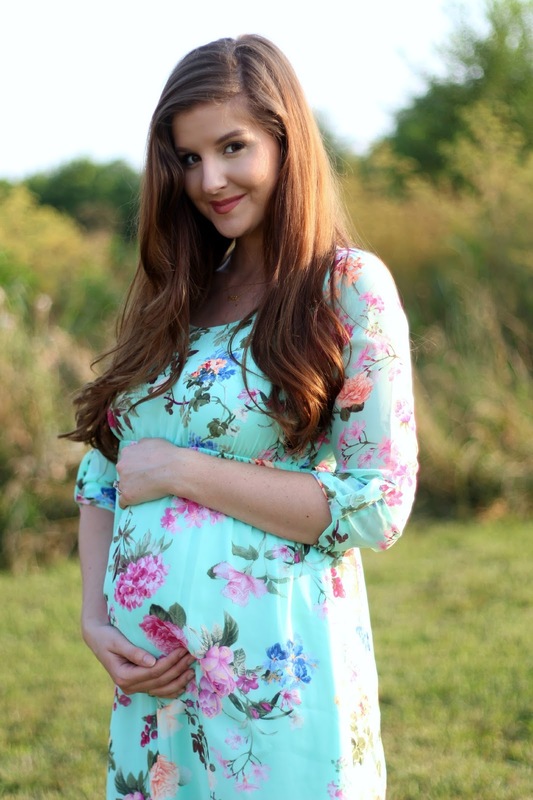 Thank you, Pinkblush Maternity, for sponsoring this post. Your pregnancy style has been so on point! I totally want to steal that dress and all your clothes really! 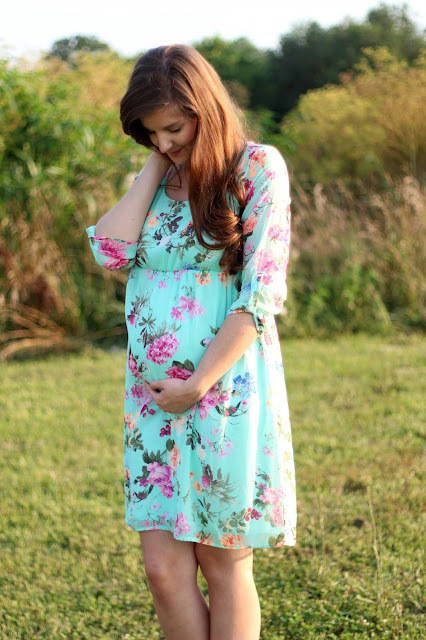 Pink Blush has the cutest NON maternity clothes ever too! I'm obsessed with everything. I could spend all of my dollars there! So I've been reading Baby Wise, and it might be a littttttle granola, but it's actually REALLY informative! You might pick it up if you need something to skim through! It's all about getting baby on a solid sleep/nap schedule so you don't hate your life hahaha. Also, you know I love PBM ;) Also ALSO, cracking up at you peeing your pants...I have had a few close calls as well!! It's getting REAL!! I'm glad that i'm not the only one peeing herself...HA! I can't believe I admitted that to the internet. That's so embarrassing! I don't mind a little granola if it's all in the name of preparation! Thank you for the advice! That's on my checklist to start researching...sleep schedule. I'm so glad we're so close together! You are the cutest ever and will be the best mama! I love that you are so happy, a lot of my friends got sad/upset during their pregnancies and then were sad after that they missed so much. I tell them all the time, it's just the hormones and no girl can control those! I definitely went through some sad times in the first 18 or so weeks, I felt so horrible! But now that i'm feeling good it's time to enjoy this little baby before he gets here!! You are looking so good! I love that dress! Hang on to that innie - it will be out soon. And it's weird. I keep reminding myself it will go back in eventually! Love seeing your updates! Thank you, Mary Leigh! I keep thinking that any day now it will pop all the way out, but for now, it's hanging halfway in halfway out! I just love all of these photos! You are so beautiful! And that dress.... Not pregnant, but I WANT it. Maybe I'll get it and gather it tighter around the waist ;) The pattern is just too pretty!! Thank you for being so sweet, Mikela!!! This made my day. Pink Blush actually makes this dress in non-maternity style...go snag one!! Ahh, so exciting! Great dress and so glad to hear everything is going well, Kylie! Thanks so much, girl! I'm feeling great, that's for sure! You look so beautiful! You glow, and that dress is super cute! Thank you, Natalia! So grateful you decided to follow along, i'm so glad to have you! Thank you, Alice! What a sweet compliment. That dress is so gorgeous! You are glowing in these pictures! !